BALTOG is considered the first man to settle in Bikol, who came from Botavara and of the race Lipod. He slays a great boar with his bare hands when it destroyed his taro field. Bikol was a land of wide plains and fertile fields; anything planted in its soil yielded bountiful harvests. The first man was Baltog, originally from Botavara and of the race Lipod. His linsa or gabi plants were the lushest in the place but were destroyed by a great Tandayag boar. Furious, Baltog pursued the boar and killed it, not with lance but by breaking its jaws with his own strong arms. The supersized boar had jawbones as wide as two arms extended, and tusks which measured about two-thirds longer than the handle of his lance. He hung the gigantic jawbone on a talisay tree near his house in Tondol. All the people who came from as far as Panicuason were struck by the monstrous size of the dead boar. Soon after, Handiong came to Bikol and destroyed the wild creatures roaming the land. In Ponong, he slew, after a ten- month fight, the beasts with one eye and three throats, winged sharks under the sea, wild carabaos and man-eating crocodiles bigger than boats. To the mountain Kulasi, he exiled the sarimaw and buried in Hantik all the serpents whose voices rang like sirens. However, he failed to subdue, despite all his efforts, one elusive snake. Known as Oryol, the snake was sometimes a serpent, and sometimes a woman. To Handiong, Oryol was a challenge, for even when he binds her over a thousand times, she would scoff mockingly at him and cleverly untie her knots. With sweet words, she would entice Handiong who would search the forests for her. But she was seductive as well as deceitful. She would thwart his labors and interfere with his battle; although there were occasions when she helped fight and kill the animals infesting the place. 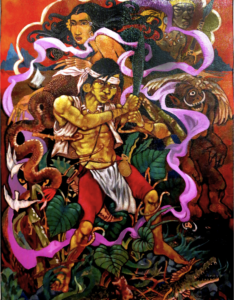 In the fight with giant crocodiles, which colored the Bikol river red, he emerged unhurt while the apes of the pongo and orangutan variety who had watched with horror were finally driven to the mountain Isarog. Having freed the land from wild beasts, he devoted himself to a settled life. He exhorted his people to plant linsa and rice. He built the first boat ever to play the Bikol river; its rudder and sail were contributions of Guimantong, one of his men, who also invented the plow, harrow and roll, including the ganta and other measures, the yoke, bolo and hoe. Hablon invented a weaving loom and bobbins. The native of Dinahon worked on the jar, claypot, stove, earthen bowl and other household utensils. Sural carved a Bikol syllabary out of a stone from Libong, and polished to shine by Gapon. Handiong and his men built towns. The houses of varying sizes hung from the branches of the banasi and the kamagong trees. The reason was that it was only up in the moog, as the houses were called, that one could escape the heat, swarming insects and wild animals. Laws were set to ensure protection of life and honor, and accord equality to all without distinction. With this, respect for rights of heritage and succession were guaranteed, and slave and master kept to his own place. Suddenly, the great deluge caused by tempests brought havoc and destruction to the growing civilization. The catastrophe completely transformed the land. Three volcanoes—Hamtik, Kulasi and Isarog—erupted simultaneously, and caused a strip of land, now known as Pasacao, to rise from the sea. Torn apart from the mainland was Malbogon, now as islet, where two witches Hilan and Lariong lived. The Inarihan river turned its course and overflowed to Ponong. In Bato, a big mountain sank, and in its place, up came a lake which supplied fish to all of Ibalon. fte Dagatnon tribe, from which had come the Dumagats from Cotmon, was wiped out as the gulf of Calabagnan overflowed. Handiong had a close companion, the young warrior Bantong. To him, Handiong entrusted the job of getting rid of Rabot, a fierce monster who was half-man and half-beast. How many of the people that came near his lair were turned into stone by the beast? The plague of the land, he was also known as the great liar. Smart Bantong first tried to find out about the monster’’s habits. And he guessed right: Rabot slept heavily all day as he simply rolled over the ground. After watching him for days, Bantong slew the monster in two parts and brought the corpse to Libmanan where Handiong viewed the remains amidst the loud rejoicing of his people. But the sight of Rabot shocked Handiong. For a long time, he remained stupefied. Why and what else happened is not known as Cadugnung stops his narration and promises to talk about it next time.— Maria Lilia F. Realubit, Bikols of the Philippines, Naga City, 1983.